We present MP3DG-PCC, an open source framework for design, implementation and evaluation of point cloud compression algorithms. The framework includes objective quality metrics, lossy and lossless anchor codecs, and a test bench for consistent comparative evaluation. 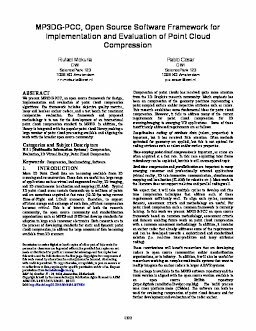 The framework and proposed methodology is in use for the development of an international point cloud compression standard in MPEG. In addition, the library is integrated with the popular point cloud library, making a large number of point cloud processing available and aligning the work with the broader open source community. Copyright is held by the owner/author(s).